Whoosh! Crackle! The Holy Spirit comes in both quiet whispers and blazing fire, sparking our faith and inviting us onward. As we look ahead to celebrating Pentecost, Paraclete Press’ new editions are sure to awaken spirits, young and old. 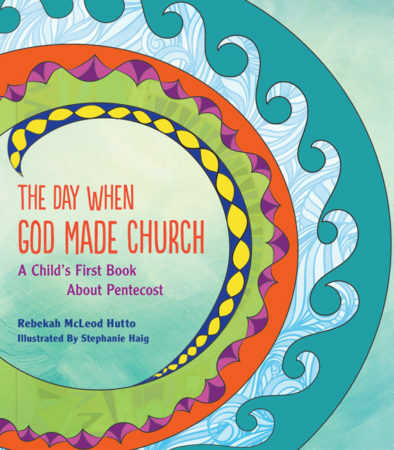 The Day When God Made Church immediately draws readers of all ages into the Acts 2 story of Pentecost. Haig’s illustrations give deep meaning to Hutto’s child-like words that tell how the disciples wait…wait…WAIT in the Upper Room. At first, the reader sees men, women, children, and animals portrayed plainly in solid colors. The first inkling of the Holy Spirit comes visually with a bright blue spark, and the patterned orange flame of an ancient lamp. One turn of the page makes the reader gasp in awe at the Holy Spirit’s presence: joyful patterns of bright colors fill the pages, swirling around the people, dog, cow, and dove! The story continues as colors visually represent the Holy Spirit’s wind and fire, warming the disciples’ hearts. Blue swirls turn into drops of rain filled with words from a host of different languages, eliciting sounds like drumbeats and whispers. Young readers will love to interact with these pages as their imaginations, curiosity, and enthusiasm are engaged by a sense of wonder. The story draws readers into the disciples’ questions: Who is the Holy Spirit? … What is happening? … Why do we feel so different? … Why do we hear so many languages? These questions beautifully set the scene for remembering Jesus, as well as for Peter’s definition of the church: We are a family that shares, eats, and worships together. The story ends with a jubilant “Alleluia!” and a visual invitation to the Lord’s table, evoking the famous Holy Trinity icon. • Bake a birthday cake to celebrate the day God made Church! • Make streamers and hang banners filled with red, the symbolic color of the Holy Spirit’s fire and Pentecost. • Scatter red rose petals down church aisles. • Create windsocks or pinwheels. • All in all, celebrate the day God made Church! As one moves through the book, each day has a short Scripture passage (pre-printed so you don’t have to look it up) and devotional content, ranging from Levison’s personal stories to insights for real-life application. After each devotional passage, there is an empty half page in which to reflect and journal in the book itself. (Levison urges readers to have a cup of coffee/tea and a pen with them each day!) Next is a reminder to Breathe which is appropriately accompanied by a swirl symbolizing the Holy Spirit’s presence. Lastly, a poetic prayer closes each devotional time. 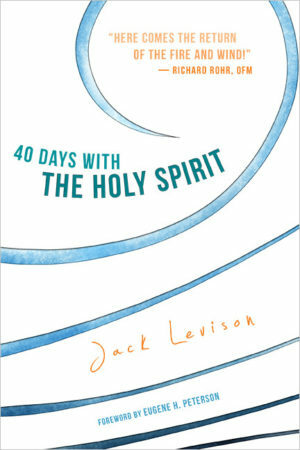 Levison chooses passages that are both well-known for the presence of the Holy Spirit (Pentecost, for example), as well as passages in which it can be inferred that the Holy Spirit is at work. He dutifully researches and backs up his insights by explaining Hebrew words in the original text. For me, this balance of passages was one of the most interesting aspects of the book: I came to faith in a more charismatic community and now worship in a more meditative community. I was encouraged to find a Holy Spirit book that deals with both the wind whispers and the dramatic fire of the Spirit’s presence in different situations. This balance also provides an inspiring growth edge for people of either worship style. Make sure to get your hands on these two excellent books before Pentecost to add wind and fire to your journey with the Holy Spirit! Alexis Kruza is a Christian educator who specializes in designing arts-integrated curriculum that gives students the opportunity to meaningfully connect their real lives and God’s word. She partners with churches to create interactive children’s programs and can be reached at alexiskruza.wordpress.com.